Ever since they tucked their caravans away for winter, many of Britain’s passionate community of caravan owners will have been waiting for the arrival of the warmer weather in order to resume their adventures. As we head towards springtime and the Easter holidays, it might well be time to get your pride and joy cleaned up and ready to hit the road! At The Insurance Emporium, we want you to make the most of your towing trips, that’s why we’ve put together this guide on preparing your caravan for spring! If you’d been hibernating for a few months, you’d probably want a wash too! 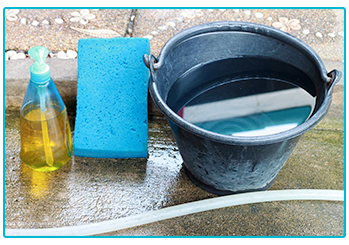 Taking specialist shampoos, sprays and sponges to your caravan and getting your ‘van nice and shiny for the road could be your first stop on the way to the perfect holiday. Just be careful with the delicate windows and seals! 2. Vac it up, vac it in, let me begin! If you cleaned your van before putting it away for winter, it might already be in a good state but could always use a spring spruce-up! Getting the vacuum inside your caravan and giving it a good clean could leave it feeling fresh for your adventures! 3. Water-way to have a good time! It’s strongly advised to drain down your water system before winter in order to help avoid frozen pipes and damage. When the new season comes around you might want to sterilise your water system and replace the filters before giving it a test. Nobody wants a mouthful of stale-tasting water! Some caravan holidays might take you on long journeys and include motorway driving. 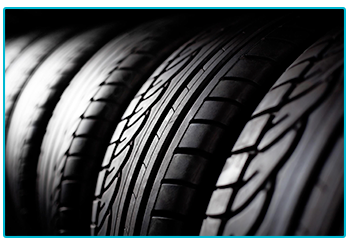 Checking your tyres before setting off could be a lifesaver. A couple of things to look out for are cracks in the tyre wall and tread depth. You might also want to try inflating them to their recommended pressure and checking back 24 hours later, this could give you a hint if there’s a puncture. Also, don’t forget to check your spare! You might want to give your batteries a good check to ensure that your start to the year’s adventures doesn’t end up a bit flat! This could involve checking the main battery to see if it still maintains charge and also replacing smoke and carbon monoxide detector batteries before you get going! 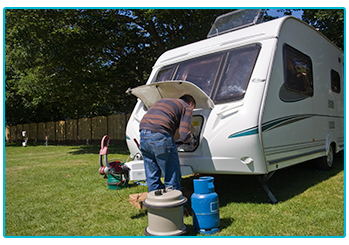 Although caravan insurance isn’t a legal requirement, it could be a huge help if something goes wrong. Taking out an insurance policy like those on offer at The Insurance Emporium could help to give you some important peace of mind on the road! Towing a caravan can be a tricky business and there are many things to remember in order to have a safe journey. Before you get going on your trip, it might be a good idea to check that all of your lights are working, this can mean the bulbs as well as the plug that connects the ‘van to power. For the safety-conscious amongst us, it could be an idea to have your caravan fully serviced by a professional ahead of the new season. If you head to the Mobile Caravan Engineers Association UK, you can source an engineer in your local area who might be able to get your caravan ship-shape for spring! The start of the touring season can be an exciting time for caravanners everywhere! Getting your pride and joy properly prepared for a year of adventures could be a vital place to start! It might also be important to make sure that you have Caravan Insurance in place. At The Insurance Emporium, our Touring Caravan Insurance includes a 25% Introductory Discount for new policies* and has a choice of Elective Benefits! Hitch up to The Insurance Emporium to find out more! *25% Introductory Discount only applies to brand new policies. This blog is in no way sponsored, endorsed or administered by, or associated with the Mobile Caravan Engineers Association UK.